As a Restaurant Manager and Foodie Blogger, I feel like I know a lot of the tricks of the trade. Even though I enjoy spending hours in a kitchen cooking, lets be real...who has that kind of time on their hands, especially with children! I am always struggling to find time to throw together not only a good, healthy meal, but something different than what we have each week. Now being an active eco-enthusiast usually means I try to utilize every resource available to me. I absolutely hate buying products (even food) if I think there is something else I have in my house which I could potentially use. I've always been amazed at the creative things people can come up with when they put their minds to it. 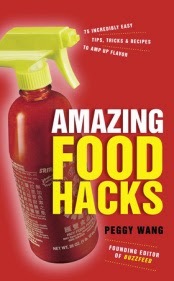 I was recently asked to review Amazing Food Hacks by Peggy Wang. The synopsis says, "MacGyver your way to a killer meal with the clever ideas, simple tricks, and lightning-fast food fixes in Amazing Food Hacks. If you don’t have time to cook, don’t like to cook, or don’t know how to turn on your oven but love to eat stuff that tastes good, you’re in the right place. Now you have 75 crazy-brilliant ways to eat awesome anytime. Boom." Right away we loved the hard cover which keeps it in great condition as you easily flip through. There are few ideas which I had already heard of prior to reading this and others which I thought were absolutely awesome. Of course we've started implementing the new ones right away. Once you discover these kinds of cheats you will find yourself thinking why didn't I come up with that and how did I ever survive without doing that. Recommendation: I love not only how easy these recipes/tricks are to follow as well as the detailed pictures included. This was great as you can easily flip through to find a quick trick all in one place. Giveaway: Random House is going to give THREE of A Lucky Ladybug's lucky readers a copy of Amazing Food Hacks to have of their own! I love making gyozas/potstickers but it is a pain because I have to make so many! My kids could probably eat 10 each. But they taste so much better homemade. Sesame chicken...so many steps and you have fry it, which is always a pain. It's really good though! homemade pizza as I make my own crut. I love food hacks - I am a DIY addict that loves to cook. This will be amazing to have in my hands! I love making lasagna, but it is a pain because there are so many steps. We like Lasagne but its a pain to make. For me, corned beef and cabbage is a pain. The corned beef always takes way longer than I anticipate. I make a sweet and sour chicken recipe that is great, but it takes FOREVER to make and is gone in minutes. I would love to make it more often but don't like how time consuming it is. Well there are actually 2 meals that we love but r a real pain. 1st is chicken-n-dumplings, so GOOODDDD and 2nd is my chicken casserole. But in the end it is all worth it, because both dishes are so yummyyyyyy!!! I would say making a simple taco salad takes a lot of work. So much chopping and having everything in separate containers ( which then have to be washed) makes it a very crazy meal! Making pizza is a pain for me! i like to make lasagna but it is very time consuming. we love to eat it. I make homemade spaghetti sauce they my family loves but it takes so much time, ingredients and always ends up on my stove top. I'm always looking for an easier way to do things, especially in the kitchen. It would most definitely have to be home made pretzels. Not actually a meal, but my world, the work and cleaning involved afterwards is rather excessive. Fresh lasagna is amazing! But definitely a huge pain to make. I love making broccoli beef.... but it is a little time consuming. I love love love pasta salad but the chopping - it takes a lot of prep. Thanks for the giveaway… homemade manicotti, stuffed shells, ravioli, etc. are always time consuming, but worth the effort because they taste so good !